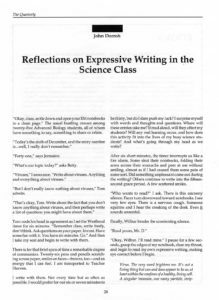 Summary: In this account of expressive writing in the science classroom, teacher John Dorroh introduces writing to build students’ curiosity, inviting them to wonder, to ask questions, and to imagine. In the process Dorroh wrestles with the issue of assessment and also demonstrates the importance of teacher-as-writer as he writes along with his students. “Okay, class,settle down and open your EM notebooks to a clean page.” The usual bustling ensues among twenty-five Advanced Biology students, all of whom have something to say, something to share or relate. “What’s our topic today?” asks Betty. “But I don’t really know nothing about viruses,” Tom admits. Tom nods his head in agreement as I set the Westbend timer for six minutes. “Remember class, write freely, don’t think. Ask questions on your paper. Invent. Have some fun with it. You have six minutes. Go.”And then I take my seat and begin to write with them. There is for that brief span of time a remarkable degree of communion. Twenty-six pens and pencils scratching across paper, smiles on faces— frowns, too—and an energy that I can feel. I am transported to Teacher Heaven. I write with them. Not every time but as often as possible. I would prefer for our six or seven minutes to be thirty, but do I dare push my luck? I surprise myself with words and thoughts and questions. Where will these entries take me? If read aloud, will they affect my students? Will any real learning occur, and how does this activity fit into the lives of my busy science students? And what’s going through my head as we write? After six short minutes, the timer interrupts us like a fire alarm. Some shut their notebooks, folding their arms across their stomachs and peer at me without smiling, almost as if I had caused them some pain of some sort. Did something unpleasant come out during the writing? Others continue to write into the fifteen second grace period. A few scattered smiles. “Who wants to read?” I ask. There is this uncanny silence. Faces turn downward toward notebooks. I see very few eyes. There is a nervous cough. Someone squirms and I hear the creaking of the desk. Even !! sounds unrestful. Finally, Wilbur breaks the unrelenting silence. “Okay, Wilbur. I’ll read mine.” I pause for a few seconds, grasp the edges of my notebook, clear my throat, and begin to read my own expressive writing, making eye contact before I begin. Virus. The very word frightens me. It’s not a living thing but can and does appear to be so, at least within the confines of a healthy, living cell. A singular invasion, one nasty particle, stripping itself of its protein coat, ‘knowing’ telepathically that something delicious lies inside this innocent cell. Massive annihilation, total destruction leaving a disease-stricken body. Life or death? Will it be the flu, a terrible, annoying cold , chicken pox, or AIDS? Will it attack someone famous, or someone simple like me? Will it bean Austrian, a banker, an entertainer? Will it result in death? How many days of work or school will its victim miss? What is the origin of this non-living, super destructive particle? What is its biological niche? Did it evolve for the sole purpose of suppressing healthy tissue? And where will it end? Will viruses be the ultimate conquerors of our planet? Inquiring minds want to know. When I finish reading, I gently place my notebook down on to my desk, waiting for some kind of response, some sort of feedback. And it doesn’t take long to receive it. “That was good,” says Tiffany. “I sure don’t. Writing freely about viruses made me think hard about them,” I add. Within five seconds, Venus volunteers to read her entry. She has written a short skit about two viruses named Bob and Vinnie. She entertains us with her wonderful imagination, bringing out several facts about viruses as she reads. Nikeya’s hand is up. I call on her but she changes her mind. “I changed my mind,” she says. “Are you sure?” I ask. She nods her head to say yes. “Maybe next time,” she adds. Two more students volunteer to read. No one criticizes; everyone seems to support one another. Community is being built. Not intending to sound heroic, what would have happened if I had chosen not to write and read aloud with my students? I have been using EM notebooks (Expressive Mode) for three years. At first I did not feel totally comfortable using them, nor did I understand their power. I did feel all along, however, that it was very important for me, the instructor, to write when they did. If it’s important enough for them to venture out into the water, then it should be important enough for me to go along with them. Last year I began looking back through my own collection of EM entries. It was eye-opening to reread selections with titles such as “Scientists,” “The Science in Thanksgiving,” and “Graphing on a Budget.” What I had was a sort of word-mural of topics studied last year. The first nine weeks of classes was as different as I ever could have imagined. Never before in my seventeen years of teaching have I offered my science students so many choices: presenting oral reports; writing skits, plays, short stories, and poems; designing original laboratory investigations; producing works of art; participating in small group work; and writing expressively in science journals. Did these choices help my students in any way? Did the expressive writing, which over ninety per cent of them chose, help them to learn content? And did they begin to evaluate their own learning and to see themselves as scientists? Next I toyed with the question of whether these journals could ever be used as authentic assessment tools instead of “just something cute” to do. And again, how could journaling help me, the instructor? I reasoned that if writing with my students expressively could give me any kind of insight into their own lives or into how they might be learning or feeling about science, then I was onto something educationally important. Through this process of changing to writing-based instruction, emphasizing the expressive mode via EM notebooks, my own writing was allowing me to learn “in parallel” with them. AHA!! I was a learner, too! I suppose the ultimate test of “usability” for my reluctant co-workers is whether journal entries can be easily graded. Personally, I detest that task with a passion. I’m not too keen about assigning grades on free thoughts and subjective writing about science concepts. However, my students could not stand the thought of doing any kind of work without receiving a numerical grade. In the last three years I’ve tried several methods of grading. The first one involved assigning a check-plus, check, or check-minus to each and every entry. That was too time-consuming, however, and students, as previously stated, demanded a numerical equivalent. Now I let them choose one of every five entries,using a pre-selected scale of grade equivalents. This entire affair of restructuring my teaching style, incorporating more writing, is a dynamic, ever-changing process, and process is still somewhat frustrating because I have always preferred the instant results that the old objective-style written tests (true/false, fill-ins, multiple choice, etc.) provided. Ironically, those easy to-grade quizzes left a scar in my soul simply because it was the only criterion I ever used to determine a student’s grade. On the other hand, reading my students’ science journals tells me so much more about them. Still though, it’s part of a process, and that translates into change. Changes for me are often too slow for my own liking. Okay, I’m the teacher and I already know a good bit about enzymes, so I want my students to know them,too.How are they feeling about these fantastic molecules? Do they get the Big Picture…yet? Do they realize that the overall basic mechanism of how enzymes work is so easy but that the details of how the reactions actually occur are quite complex? I am also anxious to hear from the professors at the university’s Department of Biochemistry. Dr. Williford’s supposed to visit this week to attack some of the 68 questions that the students have drummed up. Writing expressively in the science classroom has bonded me with many of my students. Through writing and sharing aloud, we reinforce content which has previously been introduced, and we make startling discoveries on a daily basis. I find myself growing professionally, using expressive writing as a springboard for other forms of writing based instruction. “Process teaching and learning” is slowly transforming me into a resource person and coach. Consequently, my science students are becoming responsible, curious, producers, and I find that to be particularly rewarding.